Tips, tricks and items of interest to those with an interest in genealogy. As most everyone know, Linda and Ron are involved with the Hole in the Rock Foundation. This non-profit group was formed to keep the story of the (Mormon) San Juan Mission alive–which is better known as the Hole in the Rock Expedition. 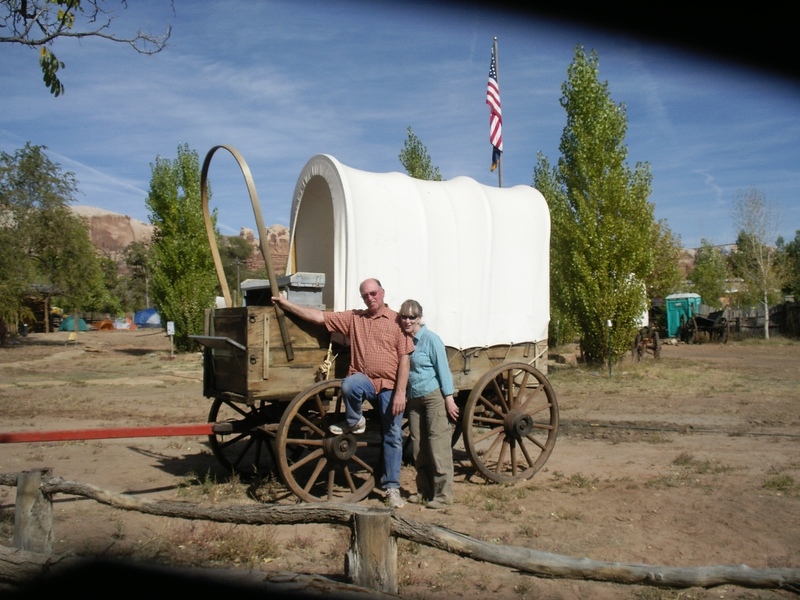 In late fall of 1879 225 Mormon pioneers left Escalante, Utah in the last major wagon train of the western settlement for the San Juan–located in the four corners region which was also called Robbers Roost. They had with them, in addition to the 225 people (12 were under the age of 1 year, and the average age of the party was 17 years), 80 wagons, 1,000 head of cattle, and between 2– and 400 horses, mule and oxen. The party planned for a six weeks journey, but the terrain had not been explored and their travels took almost six months. I was the most difficult and arduous wagon train in all of the western expansion. Yet, aside from their struggles, there were no major injuries and no deaths. Two babies were born along the way too. Their route took them to the top of the Colorado Plateau–for which there was only one way down. That is called the Hole in the Rock–a narrow crevass barely as wide as a wagon, and about a mile down to the bottom. The top 45 feet of the descent was at a 44 degree angle. Much blasting and drilling was needed to build the roadway down. Dugways were built in the low areas, and blasting removed rock from the high areas. In all, it took six weeks to complete the road. Horses refused to go down the hill, so Amasa Barton brought up two of his horses. Both were blind. They successfully made the first trip down; and the other horses followed suit. The trail, which was 50-80% the old Anasazi Trail (about 700 AD), was difficult and the terrain turned to solid rock, called ‘slickrock.’ Many obstacles were overcome, and on the final ‘pull’ of the wagon train it took seven span of horse to get each wagon to the top of San Juan Hill. That’s fourteen horses for you easterners. On Sunday, April 11th, 1980 the weary pioneers made it to what is now Bluff, Utah. The women pow-wowed for a few minute, and told their men ‘Enough is enough–we are going no further.’ In short order log cabins were raised in the form of a hollow square for protection from the indians–who were nearly at war with the United States. They built schools, churches, a co-op store, and other necessities. Originally established as a farming community, the unpredictable nature of the San Juan River made farming an unprofitable occupation. So, they turned to cattle. By 1900 the residents of Bluff had the highest new work per capita of any city west of the Mississippi River. A fitting tribute to their hard work and industry. Linda and Ron have been working on the reconstruction of the fort. In fact, Ron is the Director of Fort Construction. Much of his spare time has been spent on site, building log cabins and other facilities to handle the tourists and family associations that come to participate in fort events. Andrew Gibbons is Ron’s first uncle three times removed. He was a prominent Mormon pioneer that arrived in Salt Lake City in 1847 along with Brigham Young. He was quite famous, and was Jacob Hamblin’s translater, best friend of John D. Lee (Mountain Meadows Massacre), indian agent, AND because he was a stone mason he was given the charge of constructing the trading post at Lee’s Ferry. In mid October of 2009 Ron gave a lecture on the Hole in the Rock Expedition inside the old meetinghouse at the Bluff Fort. He jokingly made a comment about Andrew Gibbons. (He was likely one of those that told them not to go forward for fear of the indians.) After the lecture one older couple held back until all the questions were answered, then approached asking who the wife was of Andrew. Ron told them her name was Rizpah Knight. The couple, an elderly couple from Cortes,Colorado–with the husband named Lavell Harris. He was a descendant of Andrew, and a cousin to Ron. What a thrill it was for both of them to meet. While they were there for the events of the fort, unfortunately it was his wife that had ancestors in the Hole in the Rock Expedition. She was related to the Butz family. The ‘motto’ of the foundation is “Achieving the Seemingly Impossible.” and on that Friday night I did that too, by meeting a distant cousin who I share a gene or two with. What fun, and only in Bluff! My name is Lianna I am really happy I found this site! for sharing niche more secrets. This community is extremely shocking and will quicken things for me at my business. I’m one hundred percent blown away by the talent for knowledge that you have on this blog. It is obvious how excellent everyone has percieved branches of knowledge. I saved this website page and will returning for new articles. You my friends are the best very talented. I discovered the knowledge that I had already hunted everywhere and simply couldn’t come across. What an ideal web site. In my spare time I am always studying seo company in miami Its an interesting because it helps to move your web design rise to the top of the search results on bing and will get more members to sigh up which will increase the knowledge base. I want to salute for the efforts you have put in writing this website. Actually your creative knowledge and skills has inspired me to want to start my own site. Actually blogging is getting known to more people rapidly. In my off time when I am not searching the internet I am also deeply into las vegas gambling guide Well, I hope to chat with all of you soon. 539 for the iPhone 6, and from?